Pairt o a parabola (in turquoise), shawin various featurs (ither colours). 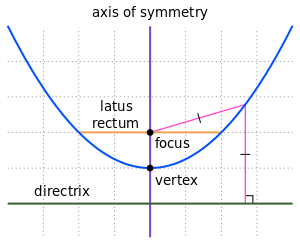 The complete parabola haes na endpynts. In this orientation, it extends infinitely upward an tae the left an richt. A parabola (/pəˈræbələ/; plural parabolas or parabolae, adjective parabolic, frae Greek: παραβολή) is a twa-dimensional, mirror-symmetrical curve, which is approximately U-shaped when orientit as shawn in the diagram, but which can be in ony orientation in its plane. It fits ony o several superficially different mathematical descriptions which can aw be proved tae define curves o exactly the same shape. This page wis last eeditit on 27 Dizember 2013, at 16:29.